When Walt Disney opened Disneyland in 1955, he told the world that this would be a park that is never completed. His vision was to have a park that was ever-evolving and the resort does seem to always have something new in the works. In 2015, the park celebrated its 60th anniversary, and with it, these fabulous opportunities. 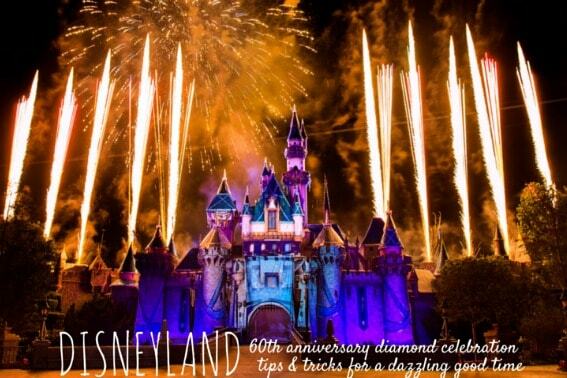 Expect to see a bit more sparkle in Disneyland this year as the park gets set to honor its 60th anniversary with a year-long Diamond Celebration year beginning May 22nd, 2015. In addition to a sparkling makeover to Sleeping Beauty’s Castle, one of the major highlights of the celebration will be the Paint the Night Parade which is already very popular at Hong Kong Disneyland. This will be the park’s first all-LED parade which will be lit with over 1.5 million individually controlled lights. The parade is set to the story of artist Mickey Mouse mixing his imagination with Tinker Bell’s pixie dust, creating a magical paint in the process which covers the vibrant costumes of classic characters such as Lightening McQueen, Ariel, Peter Pan, and the ever popular Norwegian sisters- Anna and Elsa. At Hong Kong Disneyland, guests are even able to change the colors of the character’s costumes with magic paint brushes. Hopefully Disneyland will have a similar surprise in store for its guests! The night lights up in new ways over at Disney California Adventure as well. 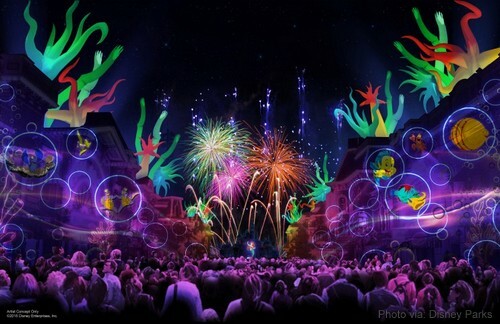 The park will feature a new World of Color show in honor of the Diamond Celebration. Known as the “World of Color- Celebrate! The Wonderful World of Walt Disney,” this water and projection show will take guests on an intimate journey through the story of Walt Disney and his big dreams using music, lasers, fountains, and classic footage to tell the story. Finally, no big Disney celebration is complete without fireworks. “Disneyland Forever,” the new firework display, will offer guests much more than colorful pyrotechnics exploding over the sky. This display is designed to be more immersive than any before, with projections covering buildings on Main Street, Sleeping Beauty’s Castle, and even the Matterhorn which will transport guests into the stories of Peter Pan, Tangled, Jungle Book, and more. Once again, Disney is sure to succeed in bringing storytelling to a whole new level. Check out a sneak peak of of Disney’s new projection technology lighting up Main Street! In celebration of the park’s 60th anniversary, Disneyland Resort guests will have the opportunity to win big during the Disneyland Diamond Days sweepstakes. Daily and weekly prizes will be awarded. Daily prize packages feature an individualized tour of the park, preferred access to attractions, dining, and VIP viewing of nighttime entertainment. Weekly prizes include a crystal Cinderella slipper adorned with a diamond-and-topaz pendant, a private party in Fantasyland, a romantic cruise on the Mark Twain Riverboat, tailgate party in Cars Land, special one or two carat Disney diamonds, and a stay in the Disney Dream Suite above Pirates of the Caribbean. Check out Trekaroo’s firsthand look at the Disneyland Dream Suite.